After entering a general planning competition at the end of May 1951 for the Jyvaskyla Institute of Pedagogics, Alvar Aalto was immediately commissioned to begin working on the plans of each of the individual buildings that were to be added amidst existing complex. He was awarded first prize with his entry ‘Urbs’, which is reminiscent of some of his previous projects. 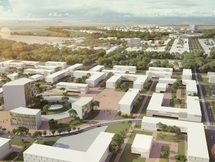 The U pattern formed by the buildings frames the open center space, where a sports field is accessible by foot. Construction of the training college for teachers began in 1953, in a ridge of pine trees close to the center of town. Known for the incorporation of beautiful views of nature in his architecture, Aalto designed a complex of buildings atop the varied terrain which he found familiar after spending his childhood and schooling in a similar environment. The main building is comprised of a fan-shaped auditorium, a three-story rectangular wing filled with classrooms, and a wing for the laboratory, all of which are connected by a hall containing a Venetian inspired staircase. Aalto’s emphasis on materiality and the combination of white walls with wood, brick and glass is fundamentally present in all of these buildings, particularly the main building. Also ephasized are the views of nature from inside the building; Aalto uses high glass panes to almost seamlessly blend together the interior with the surrounding environment. 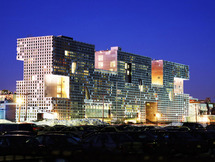 The Jyvaskyla University Library was one of the many buildings Aalto designed in the winning competition entry. These become part of the existing landscape that Aalto was very keen on including; the earlier campus was built in the middle of the teaching garden and arboretum of the 1890s. The library is two stories high with a flat roof, almost completely windowless. This allowed light to only come in through the long clerestory windows and six barrel skylights along the top of the roof. As he would also do in the designing of Villa Mairea, Aalto is very interested in the dichotomy of rigid and rectangular with curvilinear, as can be seen in some of the interior photographs. Another classic Aalto feature is the stairwell, which is enclosed by a gathering of pine that closely resembles a deeply wooded forrest in the surrounding context.